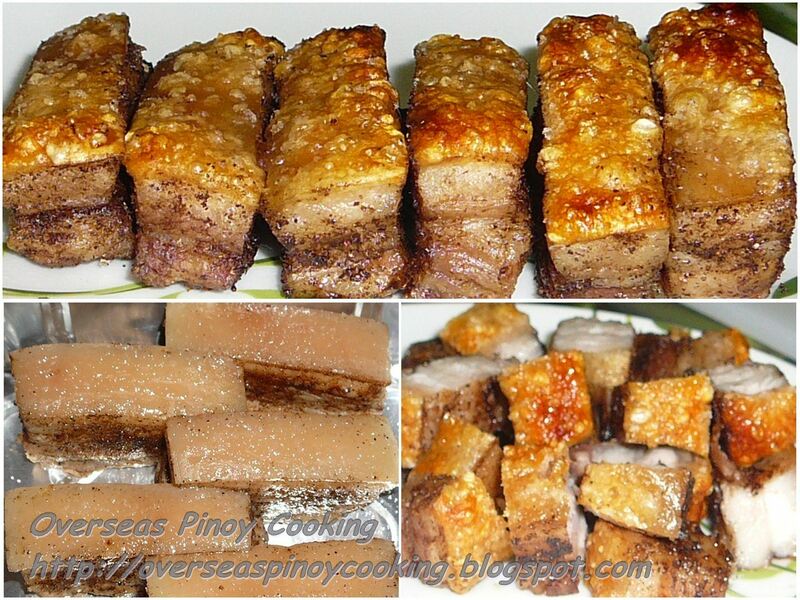 Lechon Macau, here is my version of lechon Macau using pork rasher. Fresh pork rasher, pork belly cut into about 2” by 1” rectangle are always available here at Woolworth Supermarket. I was planning to make some lechon kawali but I run out of oil, instead I end up making this lechon Macau. Seasoning is simple just rub the pork with Chinese five spice powder, pepper and salt. Here is my version of Lechon Macau. In a pot place the pork and add water to cover the meat up to about 1”. Add the star anise, garlic, bay leaf and about 1 tbsp. of salt. Bring to a boil and simmer for 30 to 45 minutes or until just tender. Remove from pot drain and let cool down. Using a fork prick the pork skin all the way down to the meat layer. The skin should be pricked as close as possible. Rub the skin with salt, then the meat and sides rub with mixture off Chinese five spice powder and pepper powder. Arrange the pork in a baking tray or aluminium tray, skin side up and enough space between the pork rashers. Let marinate with the salt and Chinese five spice rub for 30 to 45 minutes. Pre heat the oven at 250°C when the oven is hot place the baking tray at the center. Roast for 30 to 45 minutes. Check periodically if is the skin changes color suddenly, reduce the oven temperature to 200°C. Let it roast till the pork skin is blistered and turned to golden brown. Remove from oven and let rest the meat for at least 8 to 10 minutes. When ready to serve chop in into serving pieces with your favourite dipping sauce. yummm this looks incredibly delicious :)was the skin just as crispy? Hi becky, yes they were so crispy that you can break them with your hands. Thanks. this really is convincingly easier than lechon kawali. i will try this one very soon. i can't wait to have that crunchy bite. right now by just reading the recipe, i'm craving lechon kawali.. i must cook it tomorrow.. thanks for posting this..
it is easier and at least some of the fats are are drained... Thanks. Thanks for sharing your recipe. I am so much hungry with this crispy Lechon Macau. And I guess it is very easy to prepare. Good post! how many tbsp of Chinese five star powder should be used? I did not actualy measure I just dust and rub the five spice powder and salt on to the boiled pork, its about a tsp of both. Star anise should be available in most supermarket's spice section or any Asian or Indian store if you're overseas. I hope you can find one soon. i tried this recipe today and i cant believe that my husband give me a nice compliment ,,he says.. this is my good meal so far..hehhehe..thank you so much..
Looks very tasty..btw is the oven temp. indicated right? 200deg F is a bit low for roasting. should this be 200 deg C ? Thank for highlighting the error, already rectified. Salamat, oo pero palagay ko yong contributor o siguro yong writter ng TV5 ang nangupya hindi si Chef Dario. Salamat kaibigan, malaking problema ko talaga ang mga nagungupya. yong iba naayos pero karamihan mahirap sawayin. nakakamiss yung lechon macau. nakakagutom. sayang bawal ang pork ditto. Tried it for dinner, GOOD, NICE & TASTY! But failed on CRISPYNESS.